Alaska Day is celebrated on October 18 every year in Alaska, commemorating the transfer of the territory from Russia to the United States. This year, 2017, is especially significant: it is the sesquicentennial (that’s a fancy word for 150th anniversary) of the date when the U.S. flag was raised for the first time in Sitka, which was the capital of Alaska until 1906. The occasion is marked with a wide variety of activities—dances, concerts, races, tours, lectures, parades, and culinary contests, to name a few. There is something for anyone with an interest in the rich diversity of cultures and heritage found in Alaska. Happy Hollister’s author Andrew Svenson (aka Jerry West) thought the territory would make a swell setting for a children’s book. 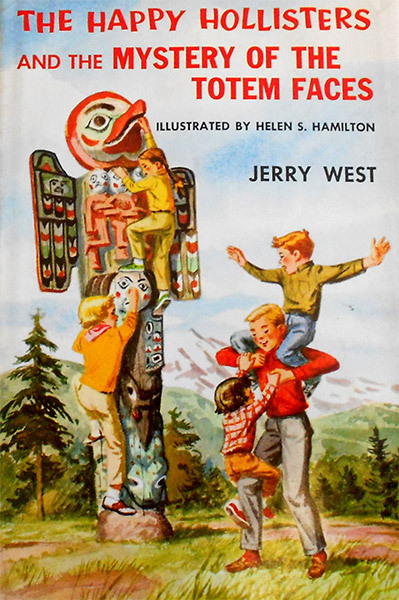 He traveled to Alaska to do on-the-spot research and in 1958, The Happy Hollisters and the Mystery of the Totem Faces was published. Just six months later, in January of 1959, the territory was admitted as the 49th U.S. State. The Mystery of the Totem Faces was inspired by the new friends Mr. Svenson met on the trip, as well as by the souvenirs he brought back for his family. His journey to Alaska started in British Columbia, where he purchased a small replica of the Thunderbird totem pole which stood at that time in Alert Bay. Alaskan lore and the stories depicted by totem poles play a large part in The Happy Hollisters and the Mystery of the Totem Faces. The mystery kicks off when the Happy Hollisters meet one of their Shoreham neighbors, a former gold miner who knows of a totem pole in Sitka that holds a long-lost clue leading to a buried treasure. Luckily, Uncle Russ is planning a trip to Alaska in search of ideas for his cartoon strip and he invites the Shoreham Hollisters to join him in his adventure. Alaska has changed immensely since statehood was granted, and it has become a very popular tourist destination. The state is now much more accessible to visitors than it was in 1958, but many of the attractions and events mentioned in The Mystery of the Totem Faces are still on many travelers’ itineraries. The Salmon Derby, which the Happy Hollisters learn about from their new Alaskan friends, Rossy and Beth Kindue, has been held annually since 1956. Of course in the story, Pete Hollister wins the Derby with his catch of a 70-pound king salmon. In reality, this would have been quite a fish story; 70-pounders have been caught in the past, but the winners are more commonly in the 30-40 pound range. The 2017 winner, with a king salmon weighing 35.6 pounds, was Paige Bernhardt, while the second place winner was 7-year-old Scotty Golden—the same age as Ricky Hollister! Participation in the derby is a family affair, with children often fishing alongside their parents and other relatives. The Hollisters also visit Mendenhall Glacier, also called Sitaantaagu, about 12 miles from Juneau. The glacier is about 13 miles long and covers almost 37 square miles. It is now protected as part of the Tongass National Forest, but regulations were probably more lax back in the 1950s. Impish Ricky plucks a chunk of “iceberg” to taste ice-cold glacial water, while cousin Jean experiences the chilly water in a more exciting way when she loses her balance and falls in! Yikes! During their stay in Alaska, the Hollisters also visit Mt. Edgecumbe Hospital (now known as Southeast Alaska Regional Health Consortium) where they meet some young Alaskans who teach them more about their language and customs. The Hollisters learn some of the native languages, how to work an Eskimo yo-yo, and how to do an Eskimo line dance. They also tour St. Michael’s Cathedral, which Sue thought looked like an “upside-down ice cream cone.” The original structure was built in the 1840s but destroyed by fire in 1966; it has since been rebuilt. The mystery at the heart of The Happy Hollisters and the Mystery of the Totem Faces culminates in the Juneau Mining District. Naturally, the children are allowed to go into the mines and chip away at the fragile rock walls to look for treasure, although they are warned by their guide, “try not to touch the walls in the tunnels.” Needless to say, mischievous Ricky can’t resist the temptation and nowadays, mine tour operators probably keep a much closer eye on their visitors! All ends well, of course, and the book comes to an exciting conclusion before the family heads back to Shoreham.